Creigh Deeds Teams Up With Abortion Clinic To Increase Abortions In Va | Virginia Right! I received several messages from friends who said they were shocked and appalled that the Deeds campaign and an Abortion Clinic would team up to advertise for abortions. One friend said she almost ran into the curb, unable to believe what she was seeing. While it may be true that Creigh Deeds is the better choice for increasing the abortion business and making A Capital Women’s Health Clinic a lot more money from killing the unborn, politicizing abortions at an abortion clinic is just sick. Don’t you think these women have suffered and agonized enough without using the the most difficult situation many will ever face to snag votes for Deeds? I wonder if they give free bumper stickers with each abortion? Perhaps they could have their own made up. Feel free to use the banner above. If you have the stomach for it, click the link above for the Abortion Clinic’s website. There you will find a price menu. Reminds me of the Fast Lube joints. I wonder if they try to up sell? I suggest people call the clinic, or drive by and honk your horn to let them know how sick this is. PLEASE NOTE: Violence IS NEVER a solution. Calls or horn honks only!!! 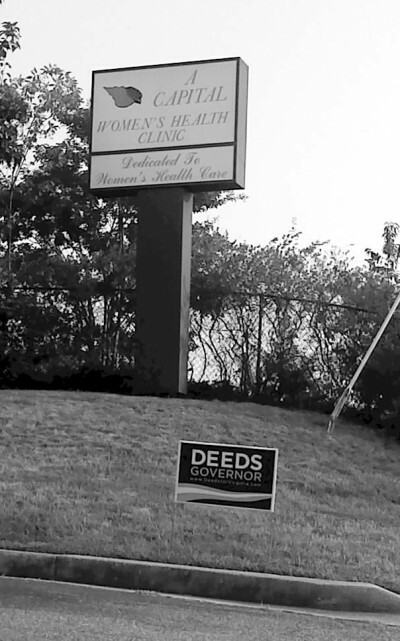 Wait a minute, the problem is there's a Deeds yard sign next to a Women's Abortion Clinic? Sportsmen for McDonnell all over again? No matter your opinion on abortion, this is not appropriate. Abortion is a political issue, but women making this decision should not have to be accosted by political signs. What's next, pro life signs on the median strip? I have been contacted by several women that are really upset with this. It is just wrong. Give me a break, anyone can put a poltical yard sign anywhere they want. Why do you presume this was placed by a Deeds supporter and not a Deeds opponent? This is just silly. Umm. Lets see. There are SEVERAL signs. ALL abortion clinics are video taped 24 hours per day for obvious reasons. And we are now on at least day 3 of the signs being there. They are there with the permission and blessing of the clinic. LOL….the sign is on a public, busy street to the side of the clinic not even on the clinic property. The photographer did a great job of getting both signs into the picture! This is deceptive, and i am pro life by the way. There are several signs. I have more photos, but this is the only one that clearly shows the clinic name. This is not a joke or any type of deception. The clinic is advertising Deeds. Go and look for yourself. Sportsman for McDonnell was a bad photograph from a bad angle and you know it . This is entirely different…and you know it. This isnt a photo out of nowhere interpreted to suit a point of view…those signs are where they are and have been for several days and have gotten attention by people driving by and seeing them….it's really okay to say they shouldnt be there…whomever did it acted stupidly, and leave it at that…not everything is a vast right wing conspiracy and Mr. Deeds does support abortion. have you looked at other sites discussing this? Do you live in the area? There are two signs…they are on the grounds of the clinic..if you live near it you can drive by…if not you can surf and see the other pictures….It's really okay to say someone acted stupidly and put signs at a location which has not been helpful to Mr. Deeds….its okay to say campaign signs/advertisements shouldnt be on the grounds of abortion clinics. even if you support choice…..its okay to say "oops" without assuming with facts and that these pictures and the reports of people who have seen the signs are made up. Give me a break! Even if the Abortion clinic did put the signs up, So What! The majority of Clinics (like Unions) will support the Dem. runner. Obvious-retards! These poor women are being used by Deeds to further their political agenda and line the pockets of the abortionists. Whenever a right leaning business uses politics to make money, you jump all over that. This should outrage any human being! But was this sign placed intentionally for support at the Abortion Clinic or was it perhaps posted for viewers that might be driving along the road I see in the picture? Obviously I don't have a clue about the layout of things around this area, but is the Abortion Clinic the only reason this sign would be placed? Nobody is trying to scam anyone here. These signs are on the property placed there by the clinic, or someone at the clinic. If this was some type of scam, I promise you it would not be posted here. There is nothing to be gained by a lie, and I would not be part of something like that. After being notified of the existence of the signs, the fact that the Deeds campaign has done nothing with regard to removal of the signs indicates a position other than denial.